The Atlanta Sängerkreis welcomes you. 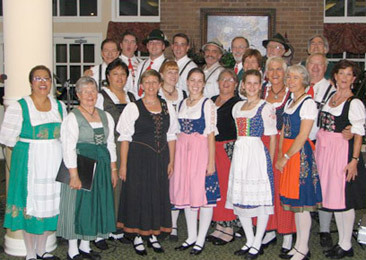 We are a non-profit performance and social group dedicated to preserving the spirit of the German culture and its history through folk song. For over 30 years now we have performed here in Georgia and the Southeastern United States at many cultural festivals, senior centers, churches, commercial establishments, etc. Whether you are interested in joining us to embrace our German heritage or having us perform for you, you have come to the right place. Our joy comes in the camaraderie of our members in our group and the chance to share our cultural background with those we perform for. We are a family that loves to embrace our German culture. Presently we consist of approximately 20 singers (sorry, we do not currently have any dancers). Among our members are native born Germans, native Americans of German heritage, and others who are simply interested in German culture or language. We welcome you to visit us both during our rehearsals and performances. We encourage and work closely with beginners. So what are you waiting for? Come out and join us!! !